It's Inspiration Tuesday at STAMPlorations, and we're highlighting my line of stamps, The Bee's Knees. From February to April, all stamps (except retiring stamps), dies and stencils are 10% off, no code needed. Following on from Maria's lead in using up leftovers, I found these two stamped and cut images in my Bee's Knees stash bag. I grabbed a white panel and lightly stencilled Iced Spruce distress ink through the Flourishes ARTplorations stencil, then matted that onto silver card, then onto 5x7 card. I added a sentiment from the same stamp set (Newlyweds) and matted that onto silver. Pop on over to the STAMPlorations blog for some more fabulous inspiration, and don't forget to leave a comment for your chance to win a gift certificate to the store. 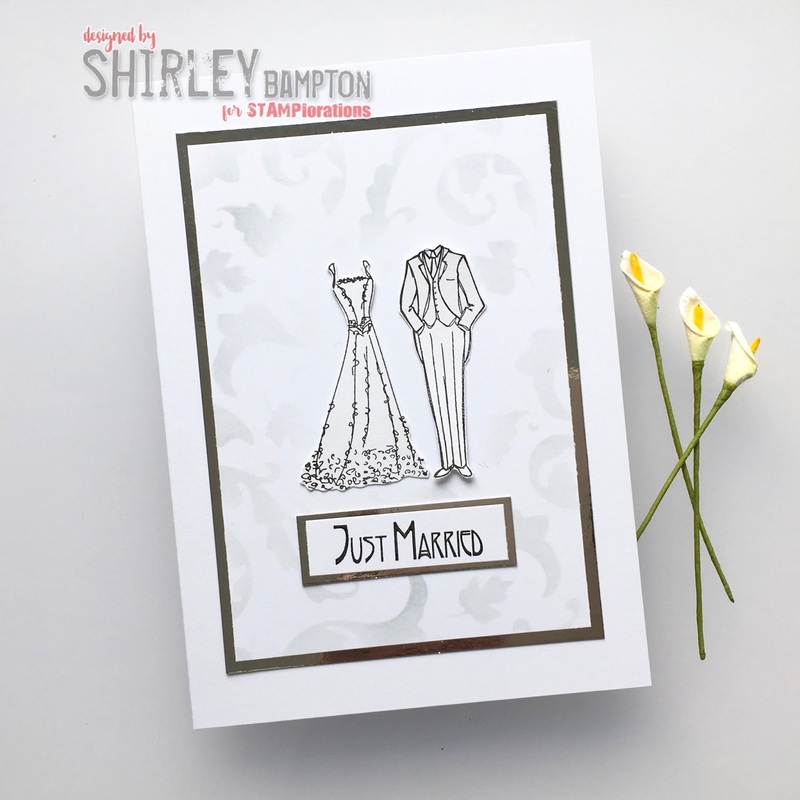 Wonderful wedding card design. Love the images of the wedding attire used on it. O my goodness, Shirley... this is stunning! That quiet stenciling brings brocade to my mind! You're welcome ;) I have still got the "use it up" bug. Of course, I won't in a million years, but I've organized the s**t and now actually reach for it! This is quite classy, BTW. And will you share pup's name? Woof. Woof.